At Truro's Lemon Quay on the 25th January Mebyon Kernow members will be making the case for devolution, talking to the public and collecting devolution petition signatures. 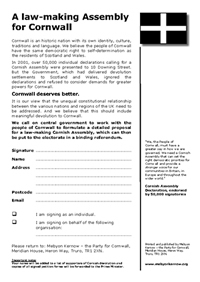 Mebyon Kernow- the Party for Cornwall launched a fresh campaign for a Cornish assembly at the annual conference, including a new petition. Now we have decided to hit the streets, holding mini events including speeches and the chance to talk to members about how an assembly would make Cornwall better. The first such event is in Truro on the 25th of January on Lemon Quay, members will be there from 10 until 4. Confirmed speakers are Councillors Andrew Long, Rod Toms, Stephen Richardson and Rob Simmons. Plus many more members. Why not pop along and speak to Mebyon Kernow members and see why we think a law making Assembly would be a leap forward in Cornish politics and a great boost to Cornwall's economy. Already convinced of the need for devolution? Sign the petition online here. For news of the Cornish Assembly campaign launch see here. Cornish Assembly roadshow on Facebook. By Rob Simmons. Published on 15th January 2014.